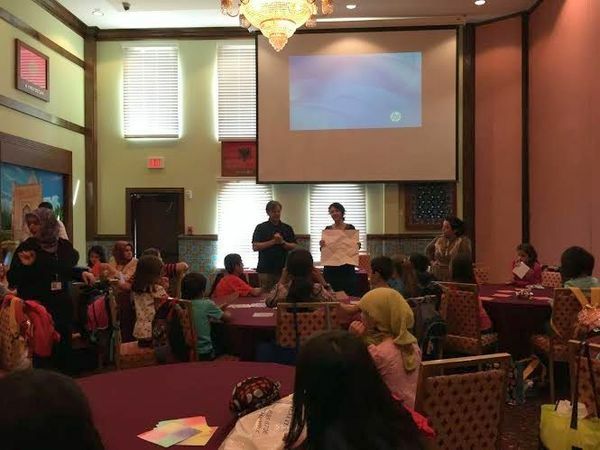 The TFAA creative workshops at Texas Children's Hospital started Wednesday, October 14th, in partnership with Little Wonders Learning Center and Eyeful Art Murals & Design. The focal point of this first session was the symbol of the door. 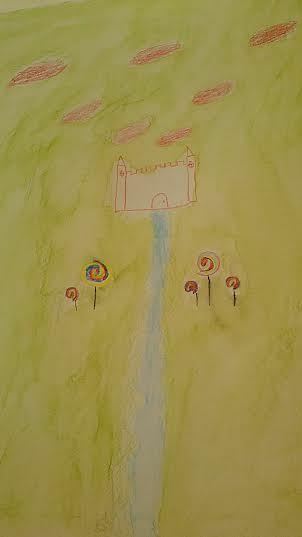 This recurring motif represents transition, opportunity, and personal growth. After all, it is through overcoming obstacles that we discover the true, unlocked potential of our creativity. Every person has the ability to open doors in his or her life, but sometimes it takes a bit of encouragement to take a chance and walk through new doors. 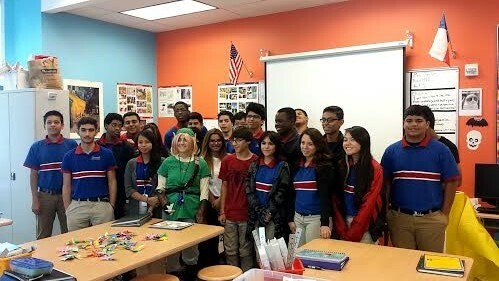 On Wednesday, October 21st, we continued working with young cancer patients, ranging from 4 to 17 years in age. We used storytelling and meditation as a prompt for inviting them to imagine their own door, as well as what may lie beyond that door. 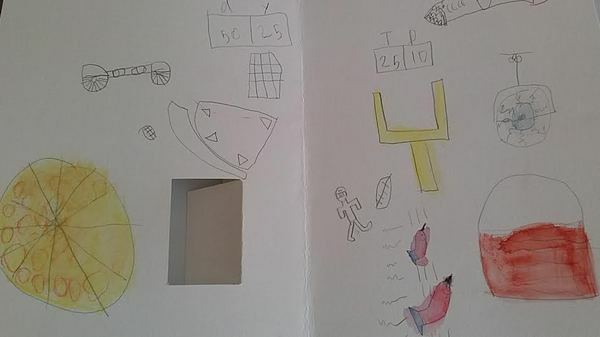 They then created visual representations of their imaginations by symbolically drawing and painting these worlds behind paper doors. Thank you to the Texas Children's Hospital team and volunteers for your warm welcome and precious help! "I want people to be happy when they see my art." 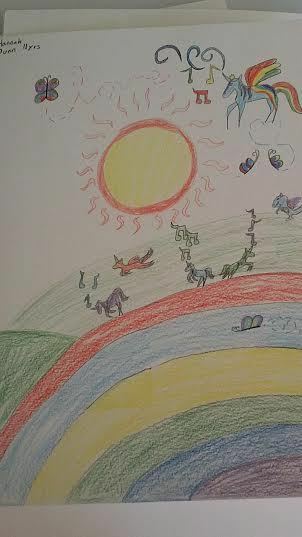 "The unicorns were dancing because they want it to rain because when it rains the rainbow will grow fruits and vegetables for the unicorns to eat." 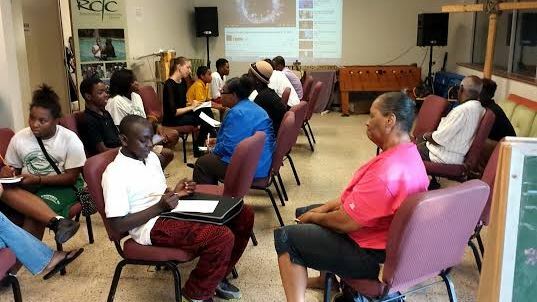 A sneak peak of what's happening in "From a Space to a Place"
This fall, the TFAA team is working with a group of students, aged 11-16, in partnership with Agape Development in Southeast Houston. These sessions, held every Monday between 4:30 and 6:30 in the evening, have proved very lively, positive experiences for both the students and the mentors. So far, the students have explored both themselves, through self-discovery and meditative activities, and the world around them, through a cultural field-trip, photography sessions with Johnny Hanson, and community-based interviews. We are excited to see their growth each week and to see their unique vision unfold through this creative process! A warm thank you to the Agape team and volunteers for the great partnership! 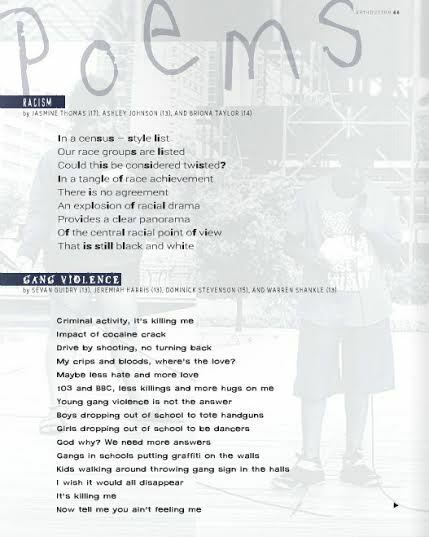 During second summer pilot of "From a Space to a Place" at Change Happens, the students chose poetry as their call to action. They wanted to educate their community about social issues such as gang violence, racism, teen pregnancy, and beautification. 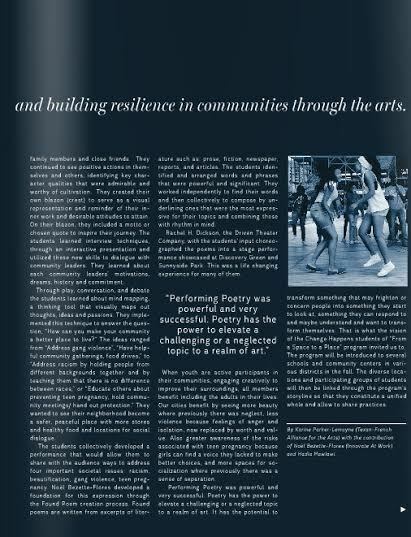 They selected words and phrases from articles related to these issues and rearranged them to form "Found Poems," which they performed live at Sunny Side Park and Discovery Green. 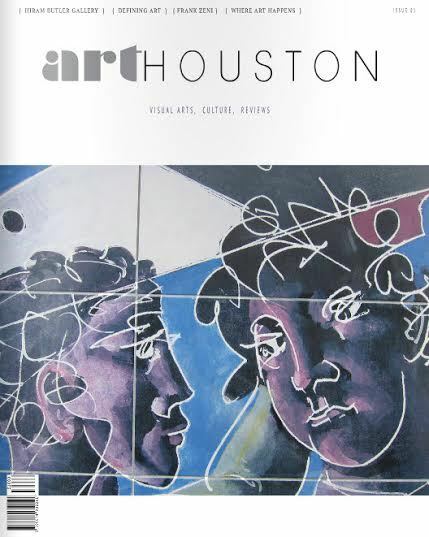 We are excited to announce that these powerful poems have been published in ArtHouston Magazine, along with an article about "From a Space to a Place." 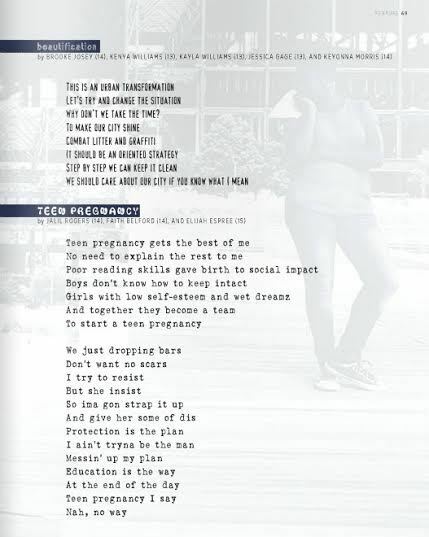 Each participating student will receive a free copy of this issue as a reminder that they can make a positive impact on their community, and on the world. Félicitations! A warm thank you to the Change Happens team and volunteers for the great partnership! Another warm thank you to Johny Bernhard for his support and for featuring us in his inspiring contemporary and already successful magazine. 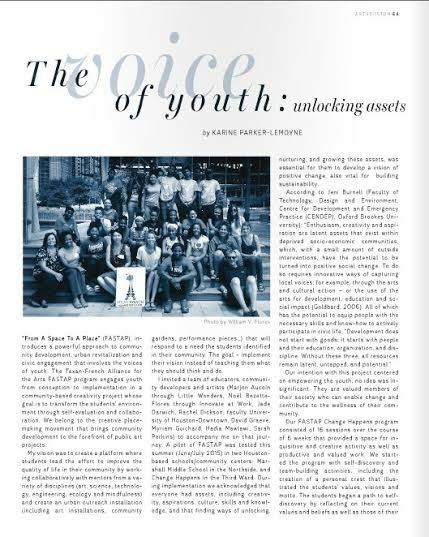 Check it out on http://issuu.com/arthoustonmagazine/docs/arthoustonmagazine_1. 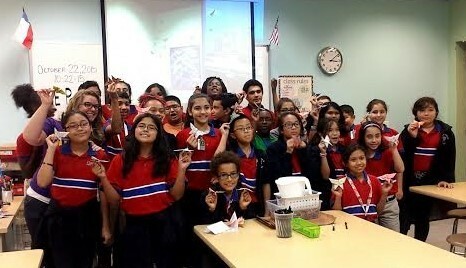 We taught many origami butterfly workshops in October, including ones at the Harmony School of Advancement, the Harmony School of Excellence, the Raindrop Foundation, and the French Consulate of Houston. 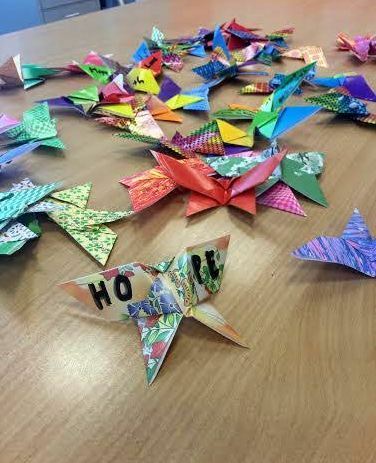 Each participant made at least two butterflies, on which they wrote positive messages of hope and encouragement. These butterflies, symbolizing freedom, diversity, transformation and strength, will be displayed as beautiful art installations at schools, at City Hall, at the Asia Society, and at the Houston Public Library. Thank you to all the teams and volunteers for your warm welcome and precious help! This Butterfly Project is a collaboration with the University of Houston-Downtown for the citywide Citizenship Month Artist Initiative. Please join us in celebrating Citizenship Month. Come to the events, give back, serve others, and help make Houston a better place! 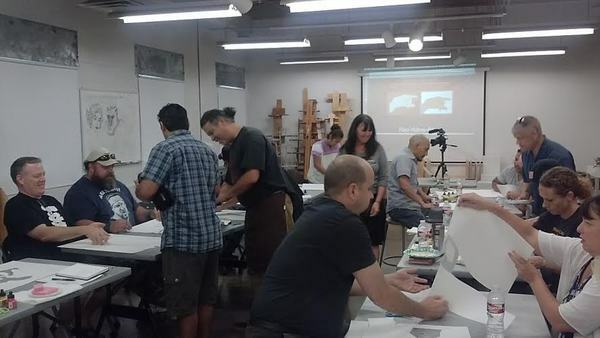 "Believe in you -- keep going"
Two months ago, we found a very hospitable home at the Southwest School of Art in San Antonio for our Open the Door Veterans’ Program workshops. 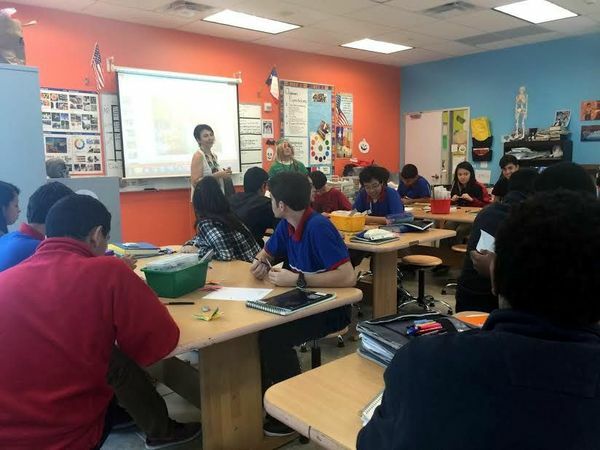 Visual artist and TFAA program director, Karine Parker-Lemoyne, worked with the founders of Art to the Third Power, Kim and Luis, and TFAA's San Antonio project manager, artist and veteran, Nick Smith, to create a safe, creative and warm environment for all the people involved. Participants included veterans suffering from Post-Traumatic Stress Disorder, artist facilitators, community members and therapists. We are very appreciative of their dedication and very proud of our accomplishments thus far! Witnessing how the process of unlocking people's creativity can help break patterns and release held back emotions, especially in challenging situations, is always very powerful and humbling. These young veterans have been through a lot and teach us even more about the meaning of compassion. In support of French and Texan collaborations, TFAA is proud of the long alliance between U.S. and French military personnel and hopes to bring the groups together in future sessions. A heartfelt thank you to all the volunteers, professionals, institutions, and friends who are supporting this meaningful project! Join Houston's most distinguished and renowned chefs at the French-American Chamber of Commerce's 32nd Annual Beaujolais Festival. Celebrating the first wine of the season in France, this cultural event will feature a live performance by Ô de mon Chéri, as well as a premier selection of wines and restaurants at the chic Silver Street Studios on Thursday, November 19th. For a limited time, FACC members can purchase exclusive VIP passes to this event. Houston’s Grammy-nominated early music ensemble Ars Lyrica Houston presents “Homage to the Sun King: Louis XIV of France” at 7:30 pm on Friday, November 20th at the Hobby Center for the Performing Arts. This program, a collaboration with the critically acclaimed New York Baroque Dance Company, features Marc-Antoine Charpentier’s sparkling chamber opera “Les arts florissants" plus royal motets and chamber works by Jean-Baptiste Lully and Jean-Philippe Rameau. Next spring, the Artistic and General Director of Da Camera of Houston, Sarah Rothenberg, will revisit Proust along with a team of collaborators, including tenor Nicholas Phan, Tony Award-winning lighting designer Jennifer Tipton, Tony Award-winning set and costume designer Marina Draghici and Obie Award-winning projection and video designer Hannah Wasileski. This new “Marcel Proust Project” stems from Rothenberg's highly-regarded "Music and the Literary Imagination" series and will be performed at the Wortham Center on February 11 and 12, 2016.